Today I will take a look at some longer term scenarios I have been sharing on this blog. It’s good to take a new look at the bigger picture at least once a year. Back in 2013 I started drawing parallels between the current decade and the roaring 1920s. While that looked farfetched back then, here we are. 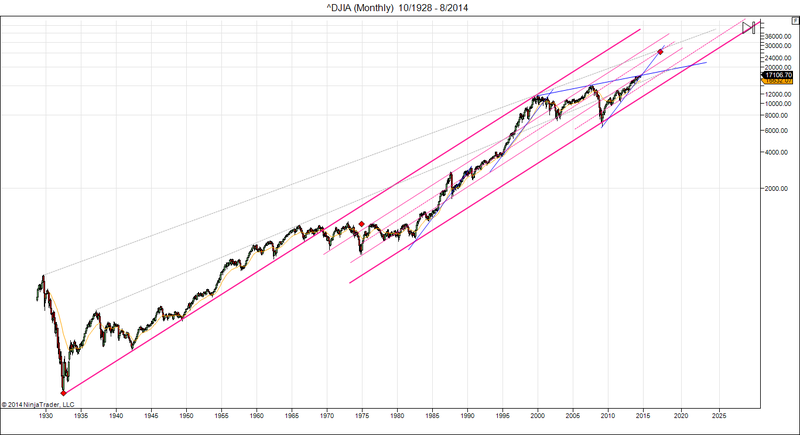 I also kept updating my Dow 32000 scenarios. That has panned out quite nicely too, even though the highest Dow target has not been reached (yet). My price target circles have done a good job and the Earl2 is at the verge of turning down. This suggests that the peak may be in, and a bear market is starting. 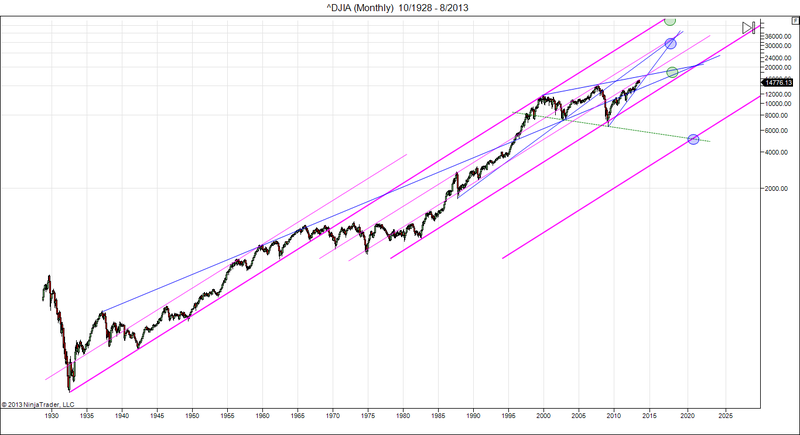 But as long as the 9 year uptrend channel holds up we cannot rule out another rally to new records next year. Long term bull markets have a habit of continuing much longer than most investors consider possible, and that could be the case again. Solar Saros 127 will be giving us a visit in July 2019, and while I would never make solar eclipses my sole consideration, traders will certainly remember 1929 and 2001, when we also had a pass of Solar Saros 127. 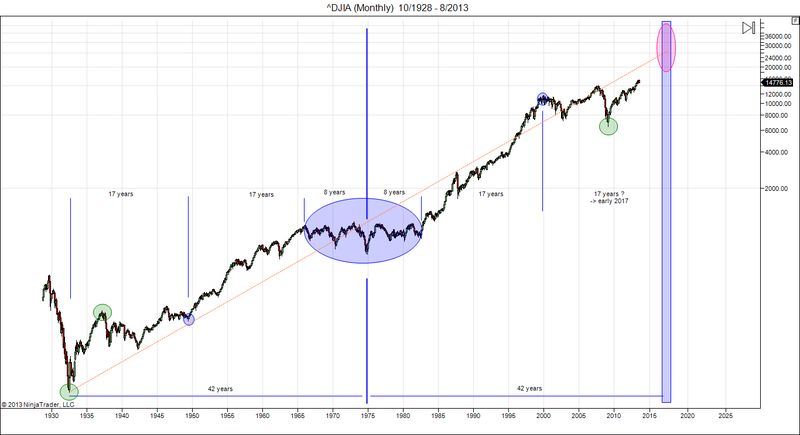 Just like in the 20s we may be due for an important peak in the “9” year. Studying the late 1920s price action may give some useful clues. The early 2018 correction broke a 2 year uptrend line. But the market has then recovered to new highs, suggesting the market is still bullish. As it now stands we still have higher highs and higher lows. It would take a drop below the February low to change that. 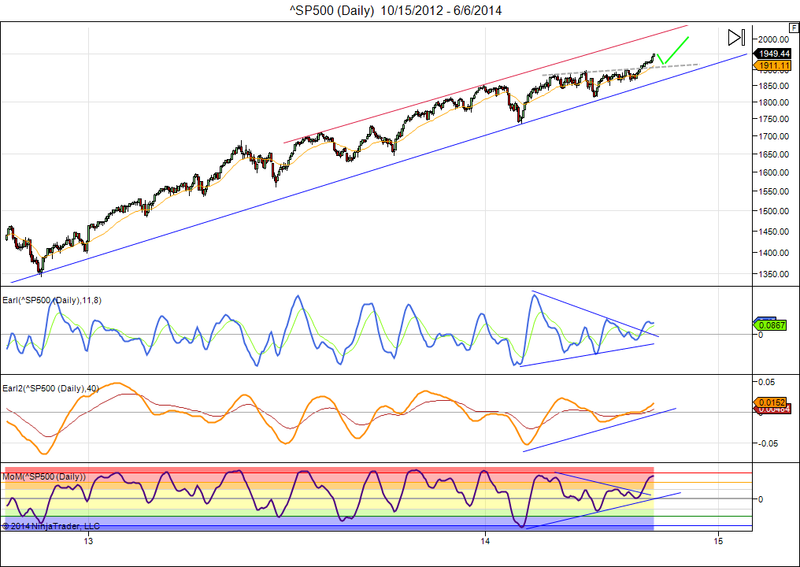 After a peak in early February there was a sharp +10% correction that broke the going uptrend line. A subsequent rebound saw the market rise to new highs a few % above the previous peak. That was followed by another sharp +10% decline, but no new lows for the year. Traders turned bearish, thinking the market had clearly peaked, but instead a final 20% rally started from that point. We have seen very similar price action in the S&P this year. That doesn’t mean it has to continue in the same way. But I would keep this scenario in mind as long as the market doesn’t break to new lows for the year. Most investors seem to be rather pessimistic right now. A quick advance to new records is probably the least expected scenario. That’s why I would give it a 50% chance at the moment. Thursday’s drop threatened a breakout to the downside, but Friday’s recovery shows the Nasdaq might try to hang on. We remain in a lunar red period until later this week, and my technical indicators are pointing down with bearish divergences in place. 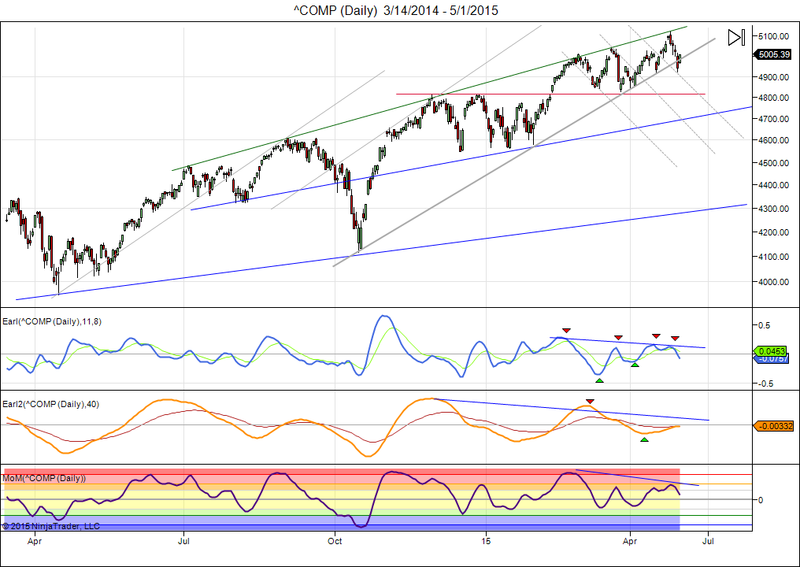 This means the Nasdaq remains at risk of a sudden sharp drop as long as this pattern is not resolved. This is still not an attractive entry point for investors who are looking to go long. So, I would wait until the sky clears. The wave projects weakness in the first half of the month followed by a stronger period. The lowest values come on May 6-8 and on May 15. The highest value of the month is on May 21, with smaller peaks on May 3, May 11 and May29-30. 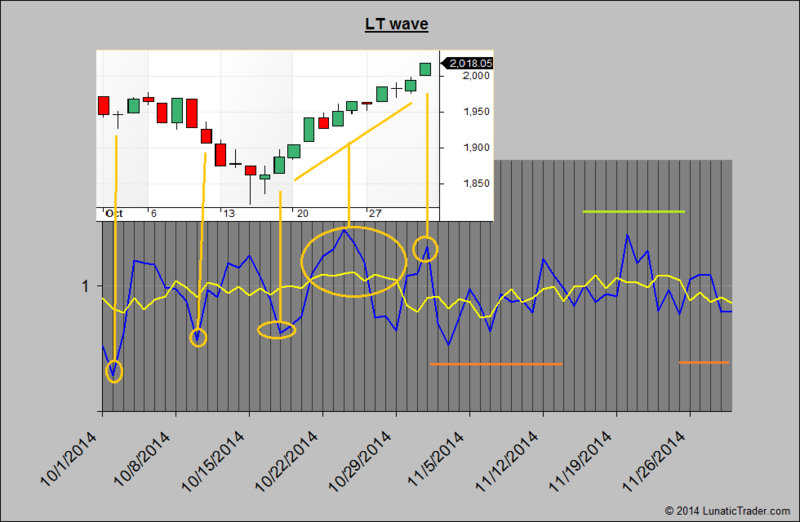 As always, use this LT wave with the necessary care as it is an experimental method. 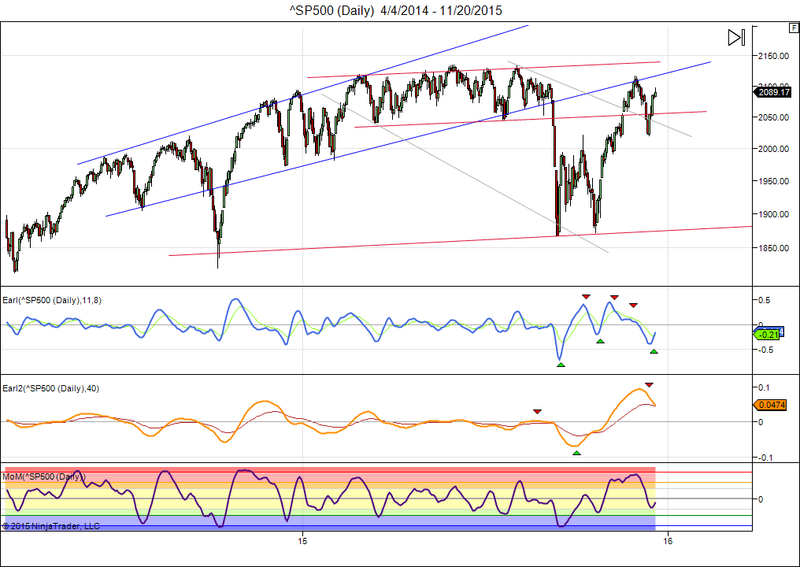 For the first time in more than a year we see the market deviate a bit from the pattern it followed in the 1920s. This had to happen sooner or later. As I pointed out in the most recent review of this scenario, the Dow needed to climb to 20000 this spring to stay on track, and that has clearly not happened. Of course, the Dow could catch up by reaching the 20000 level this summer, and then it would be back in line with the 1920s. But that remains to be seen of course. Interestingly we are ending the period that was marked by mild recession in the 1920s scenario and closing in on the point where the Fed started raising interest rates. That sparked the final mania stage in 1928-29. Are we setting up for a repeat? Most investors are probably not prepared for anything like that, so it could be interesting. The current market situation is quite similar to last February, when the market recovered equally quickly from a sell-off. The current rate of change cannot be sustained for very long, and overhead resistance is now looming near 4650 and 4700. Technically my Earl indicator is just turning down and the MoM is reaching very overbought +8 territory. But just like in February the slower Earl2 still has a lot of room to rise. The market may hold up near current levels for a while, or it may start another leg down like it did in March-April, there is no way to tell at this point. I don’t think we will get an exact repeat of March-April. I would rather look for a quick drop to ~4500 and then another rally attempt. The LT wave was not perfect in October (it never is), but it signaled some downturns and correctly showed the strength in the second half of the month. For November it shows renewed weakness in the first two weeks, followed by a stronger period with a peak value around the 20th-22nd. Despite ebola and geopolitical tensions around the world the Dow just keeps mimicking what it did in the roaring 1920s. Amazing? Well, the roaring 20s came on the heals of a deflationary shock that saw the stock markets drop some 50% in two years. The 1920s had historically weak GDP growth per capita. And the 20s had an overactive Fed which kept interest rates very low for a long time. And of course, investors remained very skeptical about the rising equity markets. In other words, pretty much the same as what are having since 2009. My long term chart now suggests that bonds have peaked out once again. 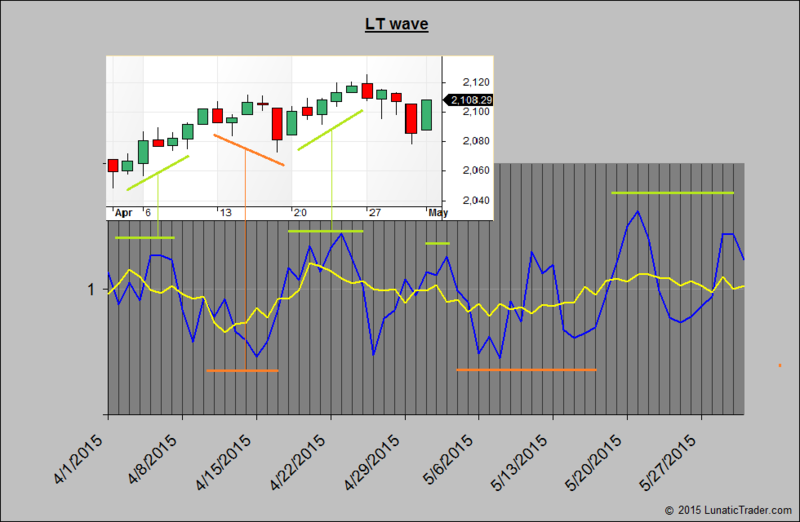 There is a broad bearish divergence in my Earl indicator and the Earl2 has turned down recently. 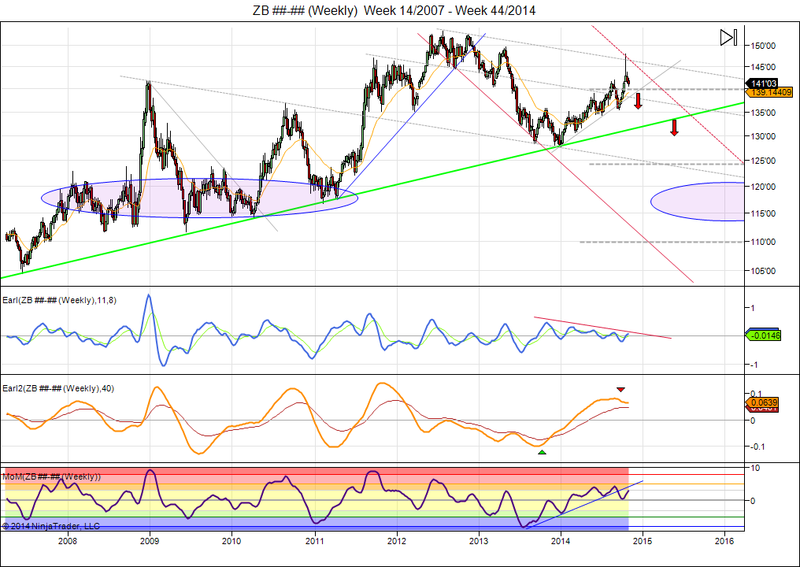 If bonds ZB drop back to 115-120 in 2015-16, then where will stocks be? Higher? Much higher? 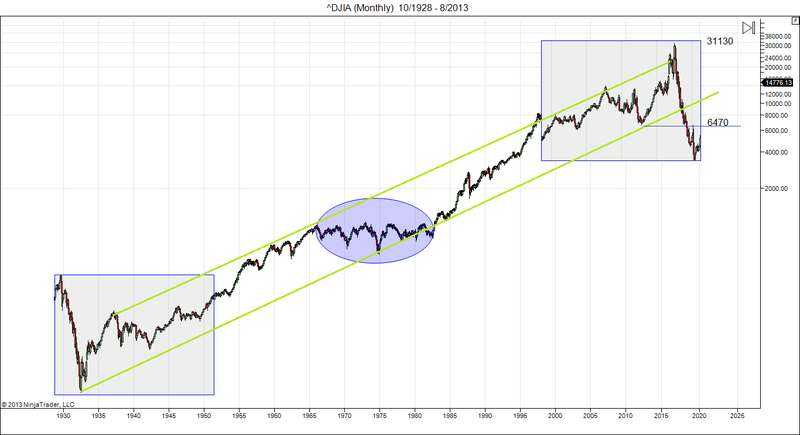 Dow 32000, after all? The big risk with QE was probably never that stocks would crash when the program ends. The risk has always been that stocks could surge when QE ends, thus forcing the Fed to raise rates to reign in a runaway equity market. But raising rates could drive even more money out of bonds and into rising stocks, further destabilizing the situation and feeding into a speculative stock mania. The bond market is nearly twice as big as the stock market, so when money starts fleeing bonds it can have an outsized effect on stocks. That’s what we got in the 1920s and that’s what we now risk getting again. QE is a stingray, dear readers, all the poison is in the tail end. Is the breakout for real? Stocks have pushed to new highs in rather convincing fashion. Is this a real breakout, or a just blow-off top? Our lunar red period has not stopped the recent rally and the S&P 500 chart is showing a clear breakout from the recent sideways pattern. This kind of breakouts is usually tested, so I think the market will drop back to 1920, where resistance should have turned into support, before possibly heading higher in the next lunar green period. Meanwhile my technical indicators have dissolved the bearish divergences that plagued the market since the start of the year, and there is now further room to rise based on the long term up trend channel. A drop below 1850 would tell us that this is a false breakout. We cannot rule out a peak at this point, but on blogs and social networks I don’t see the kind euphoria that normally comes with major tops. Rather on the contrary, I see massive disbelief, cynicism and even anger about this stock market’s continued climb. Everybody seems to be trying to go short at the top. Comparisons with 1929 or 1987 have been getting extensive coverage in financial news media, implying that we are about to crash. Few and far between are the calls for a continued bull market. It is one of the great benefits of writing a financial blog or newsletter that the responses (or absence of them) often provides good clues where the market is actually going. For the last couple of years, whenever my analysis or chart points to an impending decline in stocks, it gets comments and likes on twitter. But whenever I post a bullish scenario it just harvests silence. And for gold it has been just the reverse. So, I have gradually learned to doubt my forecast if too many readers agree with it. The scenario that nobody believes is not rarely the one that pans out. 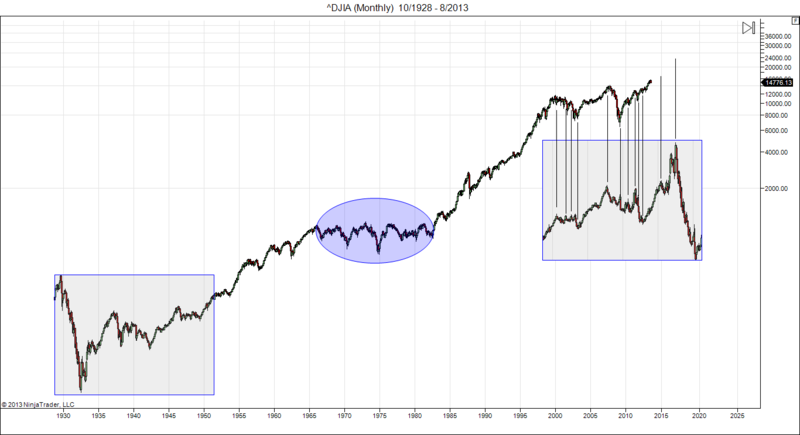 The correlation between “Dow Aug 1921 – Nov 1926” and “Dow Feb 2009 – May 2014” has now climbed to a whopping 90.4%, up from 81% when I first posted this chart. The case has become even more compelling with the news that Q1 US GDP was negative. A mild recession in 1927 also forced the Fed to delay their unwinding of ultra-low rates. When they finally started raising rates in 1928 it caused the stock market to double within 18 months, and then a collapse into the great depression. The Fed is quietly setting us up for a similar disaster, simply repeating their mistakes from the 1920s. One of the conditions to keep this scenario on the table was that the Dow needs to break out above 17000 this year. We are now very close to that point. I still think the market will deviate from the 1920s at some point. But the question is: when? Keeping up with the roaring twenties would give us Dow 20000 by early 2015, with the market spinning out of control after that. If so, I would expect to start getting comments and likes for bullish posts, while harvesting silence for bearish scenarios. That’s how we will eventually know when we are close to the top. Stocks reached new record highs last week, right at the end of our lunar green period. That marks the first solid green period in quite a while and suggests that normal lunar cycles are coming back. 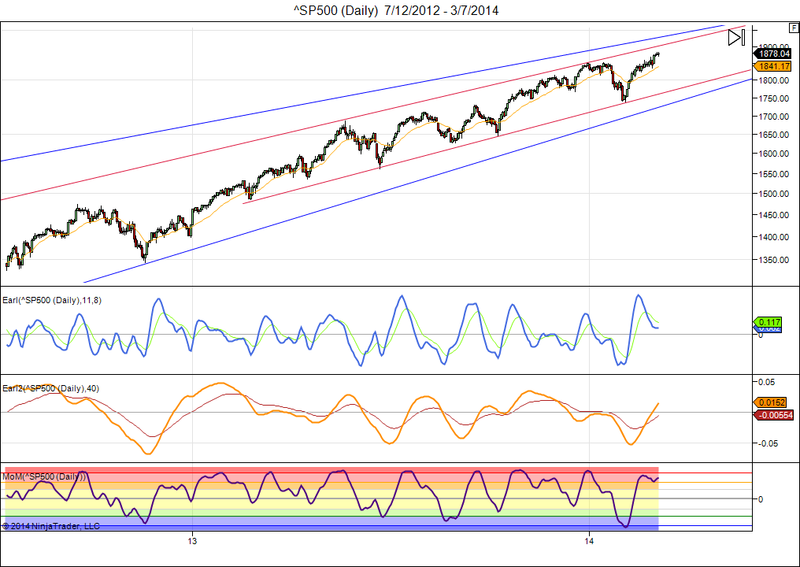 I think we will see a pullback in the current red period, but probably not as deep as many traders expect. 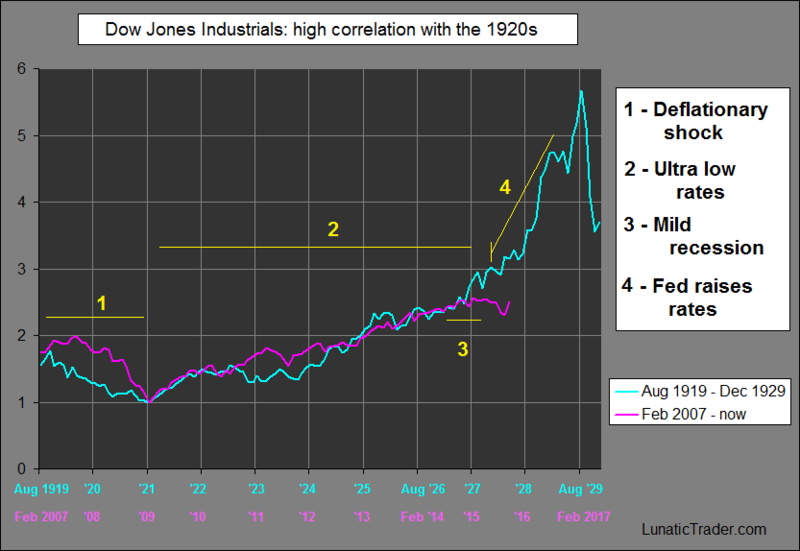 With the month of February behind us I have updated the comparison chart with the 1920s. When I first posted this chart in June last year it looked like a very remote scenario. But the case for Dow 32000 has held up unexpectedly well. One of the main conditions to keep this scenario viable was for corrections to be very shallow. That has been the case in 2013. 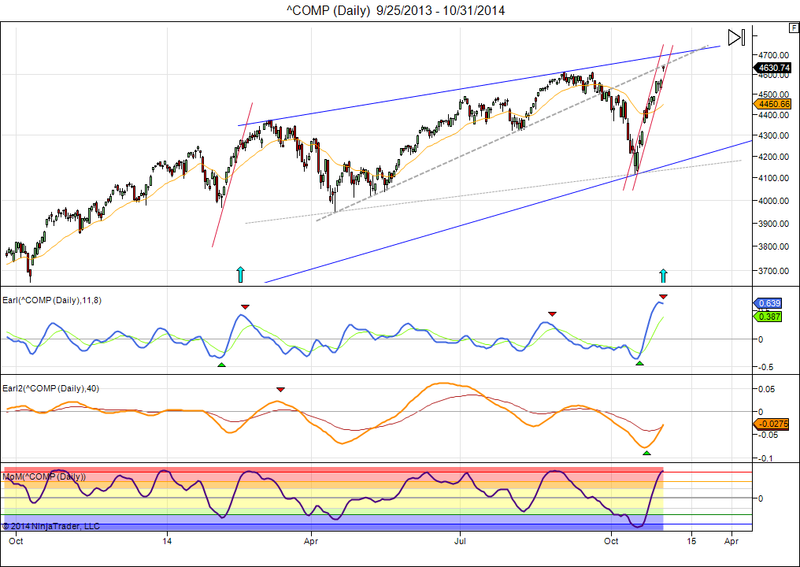 Now it remains to be seen if the Dow Industrials can push above 17000 later this year. That’s the second condition for this scenario to remain on the table. The correlation remains very high, and already started well before the bottom of the bear market. This correlation in itself is nothing remarkable, as it is always possible to find stretches of market action that look very similar. But what we have here is that the market circumstances were also very similar to the current ones. I have marked the major phases in the chart (1 to 4). The 1920s started with a deflationary depression which was followed by a long period of ultra low interest rates with the Fed expanding its balance sheet. We have been going through the same playbook and have now arrived at the point that corresponds to August 1926. At that point the stock market started sputtering and in 1927 the US experienced a mild recession. In 1928 the Fed finally started raising rates. Instead of pushing the stock market down this marked the start of the blow-off phase with stocks almost doubling in the next 18 months. So much for “don’t fight the Fed”. Could this happen again? I would rather ask: can it be avoided? If we continue along the same trail, then look for the economy to sputter in 2014 and that will keep interest rates near zero for the rest of the year. In 2015 the Fed will start tightening and that will cause stocks to break out to the upside. Why to the upside? Bonds inevitably go down when interest rates go up. This causes some money to flow out of bonds and into stocks (which look “safe” again in the eye of retail investors) and is a process that can start feeding on itself uncontrollably. At that point a disaster is inevitable. In trying to avoid another great depression the Fed will then have managed to set the stage for one. What would it take to write down this scenario? 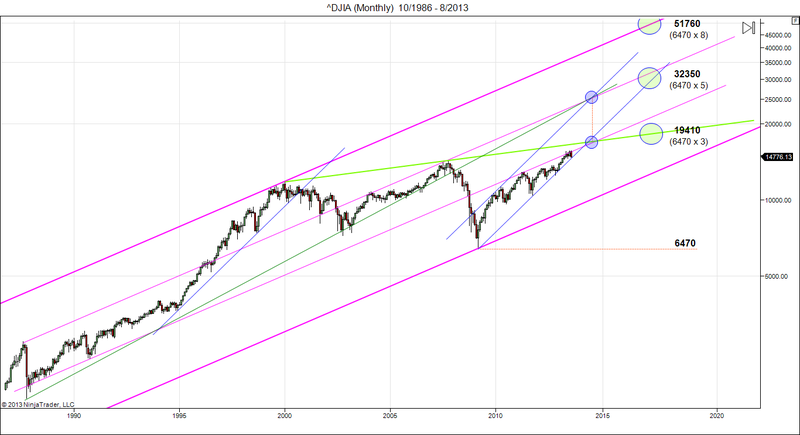 If the Dow drops below 14000 in 2014 then the odds would become very small. If you look at a long term chart of the Dow Jones Industrials it is interesting to see how symmetrical the advance since the 1932 depression lows has been. You could turn the chart upside down around a point in late 1974, and it would look almost exactly the same. If this symmetry is to run its full course, then it asks for a major high in late 2016 or early 2017. Feasible? Lining up the 1949 bottom (becomes a peak in the mirror image) with the early year 2000 high gives a good match. While there are obvious differences, we can see that most tops and bottoms line up well. Here I have matched the 1949 mirror high to the 8000 level for the Dow, which puts the correction low at 6470, which was the actual low in 2009. That sets out an upside target of 31130 by the end of 2016. By the way, I have always thought that 8000 would have been the natural high for the Dow in 2000, if it hadn’t been for easy Al’s monetary policies. The most optimistic target is just above 50000, not one I consider very realistic, unless we get hyperinflation. 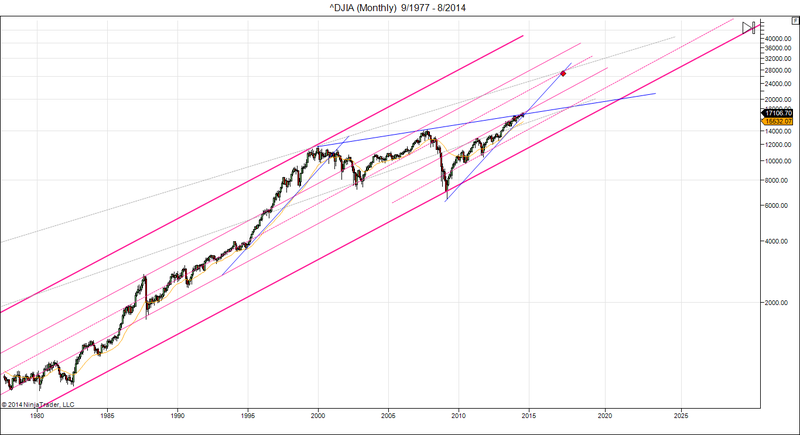 The trend channel that started in 2009 is targeting 30000 by late 2016. This advance happens to be climbing at exactly the same rate as the 1994-2000 bull market. Can this be kept up for three more years? If we get a deeper correction to 12000 or something, or if the market fails to break above the green resistance line, then 19410 becomes a viable lower target to be reached in 2016. In all these cases, a 2016 top would mean the end of this symmetric pattern, and may be followed by a 1930s style crash and depression. That would take the Dow all the way back down to 4000-5000 by 2020.